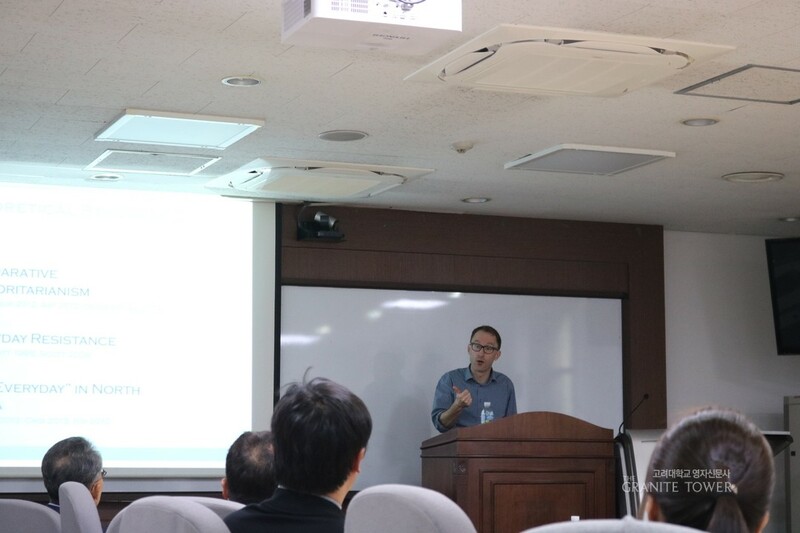 On October 11, Professor Alexander Dukalskis (School of Politics and International Relations, University College Dublin) gave a presentation on the topic of “Everyday Authoritarianism and Resistance in North Korea” at the Political Science and Economics Building in Korea University (KU). During the workshop, Dukalskis mainly gave a speech on his research findings on the relationship between everyday authoritarianism and autocratic resilience. The professor conducted qualitative and semi-structured interviews with 23 North Korean defectors and attempted an analysis on primarily four aspects: constraint, choice, corruption and complaints. In terms of extremely authoritarian feature of North Korea, he asserted, “There are three factors that set the constraint boundary: surveillance, repression and ideological control.” According to Dukalskis, even under a such suppressive environment, North Koreans covertly displayed a field of their choice through the shadow economy and the information environment, by forming self-organizations to sustain their own lives even in the situation where a rationing system does not work, and revealed a fact that the current North Korean system does not produce material prosperity on its own. The professor concluded his speech by stating that there is no clear relationship between everyday authoritarianism and autocratic resilience but instead highlighted the cross-cutting impacts of dualized life of citizens in North Korea. He claimed that the dualized life may either bolster or undermine the power of authoritarianism and revealed that any type of an unanticipated catalyst in the future might emanate a unique challenge toward the government. After his speech, the question and answer session (Q&A) session followed, where several graduate students and professors of KU gave reflective inquiries and constructive comments on his lecture to revise and enrich the data and information of his research findings.